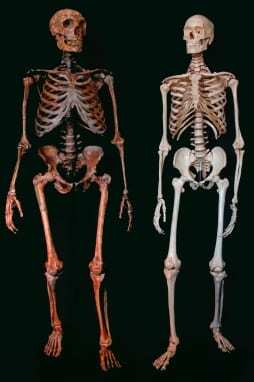 The Blog has pointed out several times in the last few months (here, here and here) that when researchers look for evidence of interbreeding between early humans and Neanderthals, they often fail to find any. During a briefing for science writers this morning at Stanford University, geneticist Bruce Lahn argued that interbreeding with Neanderthals may have introduced into the human gene pool a mutation that appears to confer an evolutionary advantage with regard to brain development. “We argue that in modern humans there may actually be some Neanderthal genes,” Lahn said at the Council for the Advancement of Science Writing’s New Horizons in Science briefings. Lahn based his argument on a gene known as microcephalin. Because certain mutations in the gene can cause underdevelopment of the brain, microcephalin is assumed to be involved in that organ’s development. Lahn described research that he and several colleagues first described two years ago in the Proceedings of the National Academy of Sciences. The researchers sequenced microcephalin in 89 people from populations around the world. They found that the sequences fell into two very different groups – so different, in fact, that they apparently traced back to a common ancestor older than the human species itself. Moreover, each of the two groups appeared to have a very distinct history of its own. One appeared to have arisen about a million years ago, and diversified at a steady pace since then. The other group, however, appeared to have arisen just 37,000 years ago and spread rapidly throughout 70% of the human population. That kind of pattern suggests what evolutionary biologists call a “selective sweep,” the introduction of an advantageous genetic variant that quickly wipes out older versions of the gene. Usually when geneticists see a selective sweep in action, the new variant appears to arise out of the pre-existing one. But in this case, Lahn argues, the new genetic variation traces back to a common ancestor that precedes both populations. He believes Neanderthals could have been that population, and that they could have transferred the “new” variation to the into the human gene pool through interbreeding about 40,000 years ago. It’s just a hypothesis at this point – and one that many geneticists consider difficult to confirm. But if ongoing efforts to sequence the Neanderthal genome find a version of the microcephalin gene identical to the one that is currently sweeping through the human population, Lahn will have strong evidence for his claim.